Born in Taverna, Calabria, Mattia Preti was one of the most important names in Neapolitan Baroque art of the second half of the 17th century. Known by his nickname “Il Cavalier Calabrese”, he was included by the writer Bernardo de Dominici in his Vite dei pittori, scultori ed architetti napoletani , one of the most important sources of information on the artist’s life. Preti moved to Rome with his brother Gregorio around 1628 and is mentioned for the first time in the Accademia di San Luca in 1632. One year later he registered with the Accademia as a painter along with his brother. In 1636 both were living in the San Biagio a Montecitorio quarter of the city. The present Concert dates from the artist’s early period, coinciding with his time in Rome in the 1630s. The painting reveals the indirect influence of Caravaggio although it was painted at a time when the importance of that artist was diminishing in Rome. Using a horizontal format, Preti locates three seated figures around a table against a plain, dark background. The canvas is one of a group of similar works in which the figures wear fine clothes that are strongly modelled by the light and amuse themselves playing cards or dice or singing and playing instruments, as in the present work. The subject matter and Preti’s approach to it have been related to the work of the large community of Dutch, French and Flemish artists living in Rome in the 17th century. 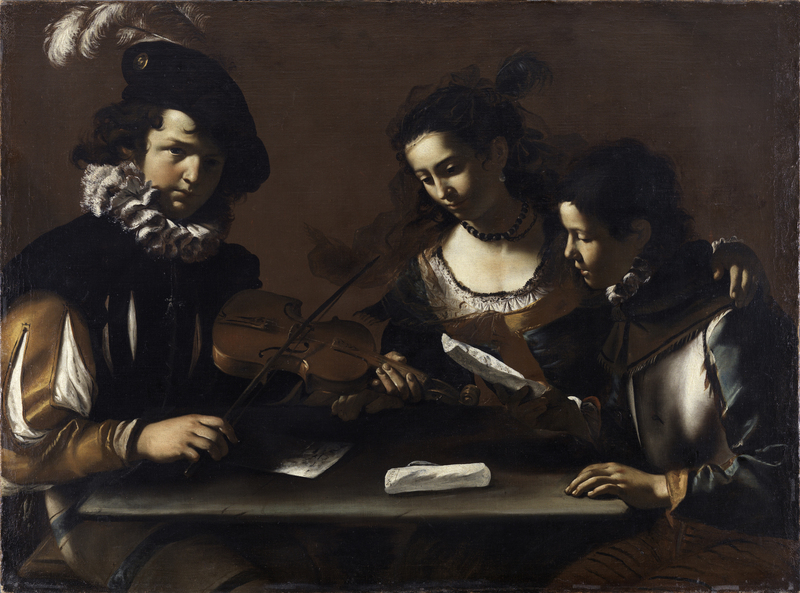 In addition we should bear in mind the compositions of Bartolomeo Manfredi, an important follower of Caravaggio, who specialised in scenes of cards and soldiers and who was responsible for popularising such subjects to a greater degree than Caravaggio himself. The Concert is one of a group of similar works including The Card Game in a private collection, Naples; The Game of Draughts, in the Ashmolean Museum, Oxford; and Concert with three Figures in the Hermitage, St. Petersburg. In all of them Preti deploys a horizontal format with three figures around a table, two men on each side and a woman in the middle. The figures wear striking clothes including hats or helmets adorned with large feathers. An exception among these works is the vertical one in the Palazzo Comunale in Alba in which the artist depicted a girl and two boys holding musical scores and singing around a musical instrument. That work also dates from Preti’s early period. The present Concert is illuminated with a type of chiaroscuro that leaves large areas of the canvas in darkness, including expressive zones such as the faces and hands. Despite this shadowy setting we can discern how the figure playing the violin-like instrument looks out at the viewer. Published for the first time by Nicolson in 1979, the painting was initially catalogued as a work executed with studio assistance. In 1983, Young rejected this opinion and considered the canvas to be completely autograph. Spike, however, saw the hand of Preti and his brother who at this period shared a studio in Rome. He detected a difference in the type of brushstroke between the figure playing the violin and the other two figures, attributing the former to Gregorio Preti due to its more compact style, and the other two to Mattia. Contini did not share this opinion and considered the figure of the violinist to be the model for the similar figures to be seen in the Ashmolean and Hermitage paintings. However, despite these differences of opinion, the opinion that The Concert is an autograph work was reinforced when the painting was included in the exhibition on Preti held at the Museo Capodimonte in Naples in 1999, which allowed for comparisons with other comparable works of the same date and style. The Concert entered the Thyssen-Bornemisza collection in 1977 and was one of the paintings displayed in Daylesford House, the residence of Baron and Baroness Thyssen-Bornemisza in the UK. A copy of the painting was on the London art market in 1960.